Rev. Kevin L. Jones is a native of Rustburg, VA, and is the youngest son of Dwight and Gladys Jones. Rev. Jones completed his education in the Campbell County School System and graduated with a Bachelors Degree in Criminal Justice from Radford University in 1996. In 2007, Rev. Jones graduated from Palm Beach Atlantic University with a Bachelor of Arts Degree in Ministry, and in August 2012, graduated with a Masters of Divinity Degree from The Interdenominational Theological Center in Atlanta, GA.
Rev. Jones relocated to West Palm Beach, FL in 1997 and has held several positions in the non-profit sector focusing on Youth Development. Rev. Jones was licensed to preach the Gospel in July of 2004, and ordained in September of 2007, at Tabernacle Missionary Baptist Church under the leadership of Rev. Gerald D. Kisner. Since October 2006, Rev. Jones has served as Minister for Youth and Young Adults, a position in which he is responsible for developing ministries and programs relevant to those particular age groups. In July of 2014 Rev. Jones was elevated to the role of Assistant Pastor. Rev. Jones is also a member of the Men’s Ministry, Church School staff, Christian Education Ministry, and the Social Justice Ministry. In January 2014, Rev. Jones was hired as an Assistant to Mayor Jeri Muoio in the City of West Palm Beach. Rev. Jones coordinates the Mayor’s Youth Council, Faith Advisory Council, and the Mayor’s Village Initiative. The Mayor’s Village Initiative’s mission is to improve the outcomes of young black men in targeted areas of the city. Rev. Jones is the Past Co-President of P.E.A.C.E., a congregation based organization charged with the mission of fighting injustice in the communities of Palm Beach County. During his time as Co-President, P.E.A.C.E. was able to win important issues in the areas of Wage Theft, Jobs and Unemployment in the Glades, Youth Crime, and Out of School Suspensions. These victories provided much needed opportunities for the least of these in our communities. Rev. 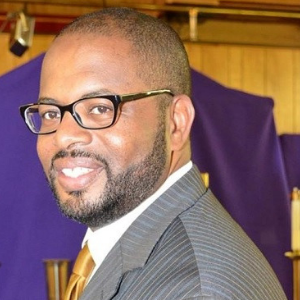 Jones is President of The Baptist Minister’s Conference of the Palm Beaches and Vicinity. He is also Co-Chair of the African American Jewish Committee with the Jewish Community Relations Council. He is a proud member and Past Master of Pride of Palm Beach, Lodge #447, Free and Accepted Masons, and the Delta Delta Lambda Chapter of Alpha Phi Alpha Fraternity, Inc. Rev. Jones enjoys coaching his sons and has volunteered for several years with the Recreation Department in the City of Greenacres, FL. Kevin is married to Michelle T. Jones, and is the father of three sons; Nicholas, Brandon, and Darrin.